Just as someone shouting in a shop is evidence of a poor customer experience in-store – and someone smiling a good one – certain digital body language denotes the equivalent online. Why is digital body language important? Measuring digital body language is essential for gaining insight into and benchmarking user sentiment at scale, which lays the foundation for increasing digital experience maturity and improving digital experiences. 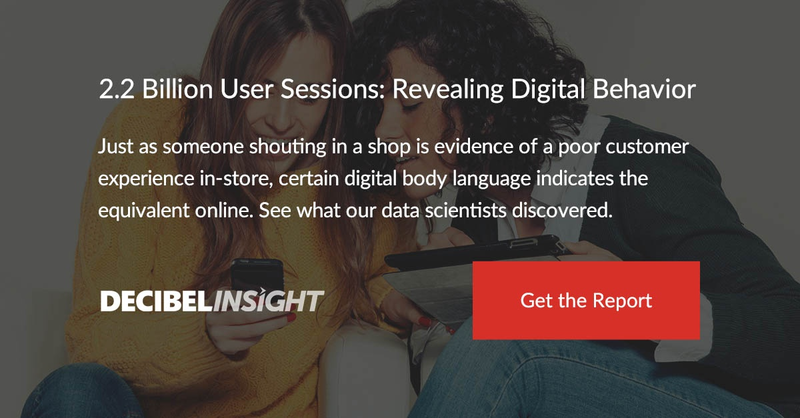 Our data scientists analyzed over 2 billion user sessions to establish trends and patterns in digital body language, identifying prevalent user behaviors that indicate frustration, engagement, and confusion. One such behavior identified by our data scientists is multi-click. Multi-click behavior refers to when a user rapidly clicks or taps on an on-page element on a website or app, denoting a frustrated user experience. It can be further broken down to ‘unresponsive multi-click’, where the behavior falls on an unresponsive element, like a paragraph of text or an image, and ‘responsive multi-click’, where the behavior falls on a responsive element, like a link or a carousel. Digging into the data, our data scientists established just how indicative multi-click behavior is of user frustration. On a major financial services website, for example, we analyzed 3 million user sessions that interacted with the site’s ‘Get a Quote’ form. We found that the average completion rate of the form was 77%. For sessions that contained a responsive multi-click behavior, however, the completion rate was just 17%. And for unresponsive multi-click behavior, the completion rate was even lower, at 14%. Another pattern in digital body language identified by our data scientists is mouse reading. Mouse reading behavior refers to when a user directly follows the content they are reading on a website or app with their mouse, denoting an engaged user experience. Our data scientists found that average user sessions completed 0.31 goals per session, while user sessions containing mouse reading behavior completed an average of 0.98 goals. To learn more about digital body language – and see all the behaviors detected by our data scientists, as well as how the world’s leading companies use them to measure and improve digital experiences – download our full report below.